The German Federal Republic was created on September 7th 1949 with the formation of the Bundestag under Chancellor Konrad Adenauer but it wasn't until 6 years later that this new West German state was permitted to raise its own independent Armed Forces. The first military in-take on November 12th 1955 comprised volunteers from the Federal Border Guard, with all candidates screened to prevent former Third Reich-era Wehrmacht & Waffen-SS members re-enlisting. 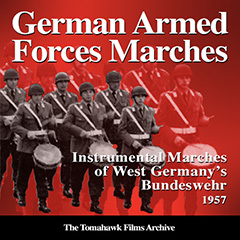 However at least four former musicians from Hitler’s bodyguard division, the SS-Leibstandarte 'Adolf Hitler' and a number of younger Wehrmacht musicians were known to have ‘slipped though the net’ and these experienced WW-II veterans would help continue Germany’s famous military musical traditions into the early days of the fledgling Bundeswehr in the late 1950s. The Stabsmusikkorps der Bundeswehr (Staff Band of the Army) was created on February 16th 1957 under a training designation, or Lehrmusikkorps, at Rheinbach near Bonn, initially with 16 musicians, though on June 16th 1957 Hauptmann Friedrich Deisenroth took over musical command and a month later increased this new musical strength to 50 bandsmen. Their first duties included playing alongside the Bundeswehr’s Wachbataillon Honour Guard in the new capital city of Bonn whilst September saw its first performance in public.